I wasn't really able to get a full picture of it, due to my ridiculous lack of Skills of a Photographer. But you can see the button band, which actually turned out pretty well, and which was the reason I dropped this project last June and never picked it up again. I happened to have the perfect color of thread to attach the buttons, so I wove in the ends and sewed on the buttons on Tuesday and wore it on Wednesday. 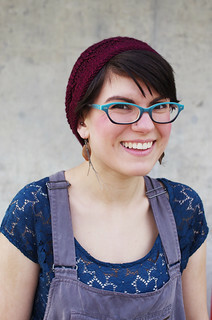 I saw a couple of my knitting friends around campus, and they all smiled at me knowingly and asked if I had made my sweater, to which I could finally say, "Heck yes I did!" The boy person approved. We went out for a walk and some whole wheat donuts at the little memorial park right off campus, and while we were sitting on a park bench, he petted my shoulder and made faces at the sweater. Hahah. The weather in Ohio has gotten absolutely amazing in the last week or so. 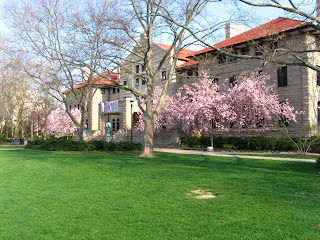 The magnolias are blooming everywhere, and the apple and cherry blossoms are starting to come out, too. I spent a lot of time outside this week, studying calculus on the porch of the student union, underneath the massive amounts of bee-filled magnolias. And the only reason that the above picture isn't full of hippies is because it was 8 in the morning, way too early for them to be awake! Oh yeah, and - big surprise! 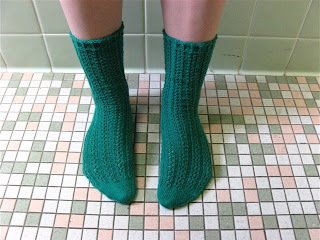 - I finished more socks. 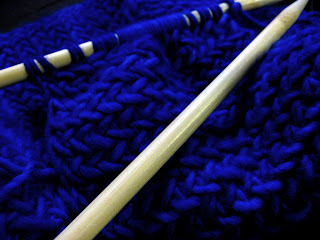 Friday, I started My So-Called Scarf with the Malabrigo worsted I bought in Santa Cruz. I'm finding it impossible to photograph the color of this yarn - it's absolutely luminous, so deeply saturated with color that the camera can't figure out to do with the excess. This blue makes all other blues look anemic in comparison. 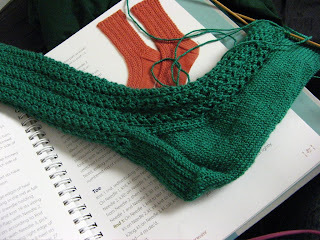 The pattern is perfect for this yarn, and so far it's a fast knit. I haven't done anything snazzy except to add a slipped stitch at each edge. I was worried that the color wasn't interesting enough for a scarf, since most people tend to use Manos or Malabrigo in handpainted colorways, but no, everything about this scarf - texture, stitch definition, color, softness - is perfect. I love it when that happens! This yarn makes me tempted to buy enough for a sweater. Mmmmm. I have been productive on old projects, too. 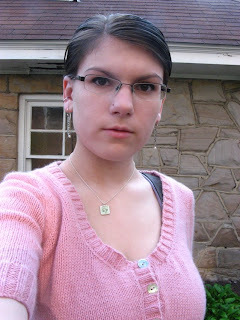 The pink sweater has been languishing on the needles since April of last year, so I figured it was time to sew it up. I forgot how much I enjoy the yarn - it's mostly cotton, but it has a soft halo because of the cashmere. I have some buttons for it already, and all that's left is sewing up the other sleeve and picking up the button band. I know I probably should have done that first. Oh well! Today is my 20th birthday. For some reason, no matter how old I am, I always love my birthday. This is the first time I haven't been home on April 15th for... well, ever. My mom sent me a package that I opened this morning, which was full to the brim with small but wonderful presents. A whole lot of yarn. 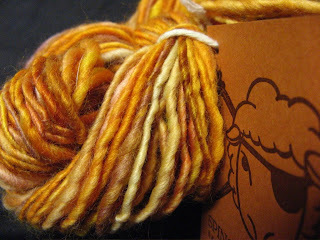 The orange skeins are from a spinnery in Bellingham, Washington, a little artsy town near the San Juan Islands. They are unbelievably soft. It's funny, because this yarn isn't the kind that I'd normally pick out for myself, but it's still very much within my yarn personality... sometimes I think that my mom knows me better than I do. 1 skein of Colinette 100% silk in a luminous pink color, colorway Copperbeach, 117 m.
I'm fairly sure that someone is going to have to mop me up off the floor later tonight. I am absolutely overdosing on fibers, and it feels so good. 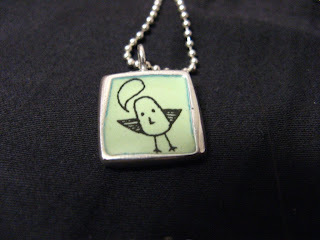 Also included in the package was this adorable necklace, which is two-sided and is just so cute I can barely contain myself. "I love you so much, I could eat your face!" My roommate also got me a pair of pink rainboots (so now I can stomp in puddles asjkdfjjjj), and my boyfriend has been conspiring with her to do something for me tonight. I feel so loved! This weekend, Nancy, Bethany, and I went to the closing sale of a yarn store in Vermilion, Love to Knit. As we were browsing, I saw a few wonderful things - Koigu in a ton of different shades, Jitterbug, Jamieson & Smith jumperweight, and Cascade. 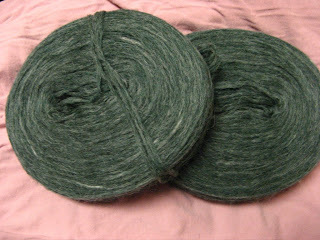 But then I came upon big stacks of unspun Icelandic wool... and knew that I had to get some. As I was walking home, I suddenly wondered why so many of my favorite ideas and projects lately have been various shades of purple. 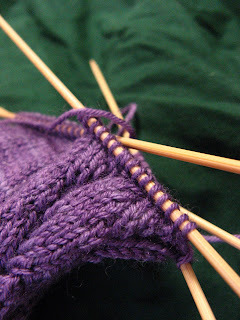 I have a deep purple Tubey on the needles, as well as the purple Waving Lace socks. I'm wearing my purple Meidas today. I'm lusting after cables and lace in crisp, lavender linen yarn. 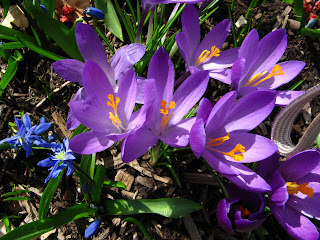 And then I looked at the flowerbeds next to my dormitory, where crocuses, violets, and daffodils have been exploding into bloom ever since the temperature got above 40 degrees. Those things must have psychotropic pollen or something, because they are affecting my subconscious yarn desires and making me want to put on a skirt and.... frolic. Who knew my brain was so easily influenced?! These socks are my Santa Cruz Waving Lace socks. For some reason, I had a serious jonesing for Lorna's Laces... so while on spring break in California, I picked up two skeins of Grapevine and cast on. I have one finished and half of the cuff of the second. 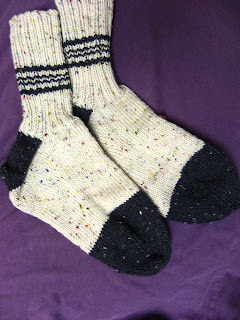 They are my between calculus problems socks; my before lab socks; my "oh I'll just knit a row before dinner" socks. 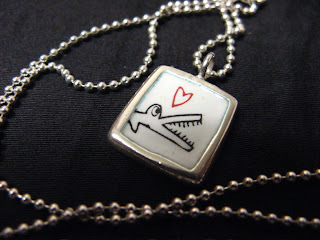 I'm in love, just a little - and they've gone so fast! No second sock syndrome in these parts. I've been on a sock kick lately. 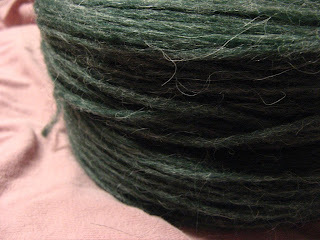 Portable, interesting, and small quantities of (and thus inexpensive) yarn? Sign me up. I'm also pretty seriously obsessed with Favorite Socks. 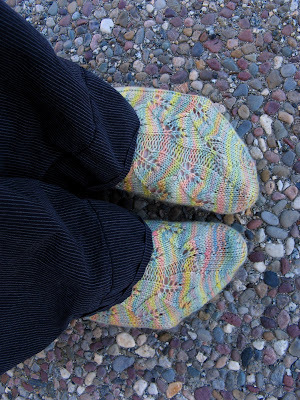 The last three pairs that I have made have either been directly from or adapted from patterns in FS: I love the simplicity of the Waving Lace sock, and Lorna's slightly variegated solid is perfect for showing it off; the Embossed Leaves socks are delicately floral in a springy green Koigu; the Eesti Hiking Socks, though adapted, had a rustic and definite Manly appeal (must make boyfriend Manly socks to make up for giving him dainty ceramic kitty mug for birthday! Ennnnnggh!). Luckily - or unluckily, depending on how you look at it - my yarn buying has slowed, but not stopped. I went on a little bit of a binge over spring break. My roomie and I ended up in California after taking the train down from Seattle. One day, I visited the boyfriend in Santa Cruz and he decided to take me to all the yarn stores he knew of. 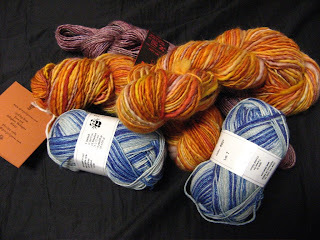 At one store, I bought two skeins of blue Malabrigo that is almost gemlike in color - deep blue, the color of the cups in my mother's best friend's kitchen when I was a child. 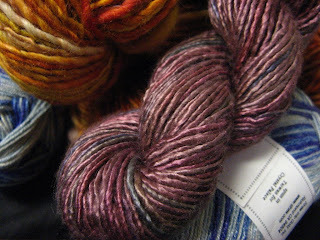 I also bought the aforementioned two skeins of Lorna's Laces. 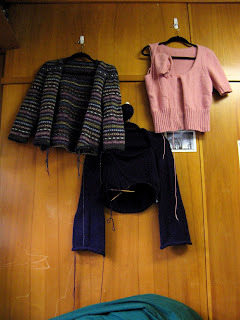 A few days later, I bought a skein of laceweight Malabrigo in Capitola, along with some Addi Turbo circular needles to make the Swallowtail Shawl - my first shawl, planned or not. I'm hoping to cast on soon... but only after I burn out on socks! ...it might be a while.